Former BBC Australian correspondent Nick Bryant has just published a book titled The Rise and Fall of Australia: How a great nation lost its way. He documents the Hawke-Keating policy reforms that continued under John Howard. The reforms got us through the GFC, but their impetus didn’t last. For a decade or more, populist politics and vacuous policy have been the norm. We needed a circuit breaker and got Clive Palmer. He is demonstrating an ability to thwart some of the inequities in the Coalition’s Budget and legislative program. But he appears to stand for policy that is confused and inconsistent and lacking in the depth and long-term vision that is sorely needed. Moreover he is perhaps motivated more by self-interest and vengeance than social inclusion. On the one hand Palmer is effectively performing the ‘keep the bastards honest’ role that was identified by Don Chipp when he founded the Australian Democrats back in 1977. Palmer is succeeding in his attempt to force the Abbott Government to embrace the tricky challenge of producing legislation that will ensure big business passes on to ordinary Australians the savings it will make from the abolition of the price on carbon. But on the other he plays hardball when there are attempts to scrutinise his own business dealings, as we saw in his instantly famous walk out from Thursday evening’s ABC 7.30 interview. Palmer is nothing if he’s not a man of surprises. Nobody expected that he would share a platform with Al Gore, advocating action on climate change. We don’t yet know whether this was merely a stunt, or if it will amount to something. If he sets his mind to it, anything is possible, and it might not matter what his motivation is if he is able to make a positive difference. In Twiggy Forrest, we have seen another wealthy and sometimes controversial mining magnate, join forces with world religious leaders including Pope Francis to support a network that aims to end slavery. It’s unlikely that Palmer will do anything to facilitate the serious policy development that we need, and that is probably the role of others. There’s the recently established Melbourne Economic Forum, which Professors Ross Garnaut and Peter Dawkins are promoting. It aims to bring together leading economists to analyse policy ‘in the public interest’ in a way that is ‘independent of vested interests and partisan political connections’. But while the Melbourne Forum will advocate for a basic fairness that was lacking in the May Budget, their input will only go a certain distance in that it will regard the human person as an economic unit. They are experts in rationality but compassion is not part of their remit. To satisfy the broader human and spiritual needs of the population, it is necessary to pay attention to the vision of leaders like Pope Francis, who has a strong regard for both economic policy and common humanity. The pope and other religious leaders need to forge partnerships with high profile and entrepreneurial personalities from spheres of influence such as business and entertainment. In joining hands with Al Gore, Clive Palmer showed us that he is capable of forging unlikely alliances that could sidestep certain vested interests in order to make a better world. Clearly he has a mind to cultivate others, and Pope Francis could be on his list. I believe one of our current PM's printable nicknames is "Father Tony". Anyone who allocates themselves the high moral ground and is shown to break their word, as Abbott has on a number of occasions, is seen as untrustworthy. Politics is, as played in contemporary Australia, an amoral game. Because Abbott is Catholic by birth, went to Riverview and claimed the late Emmett Costello as a mentor (as numerous others would have) we expect him to be a Christian gentleman; play with a straight bat; be concerned for the poor and refugees. He is not like that. He is as amoral as the next politician. 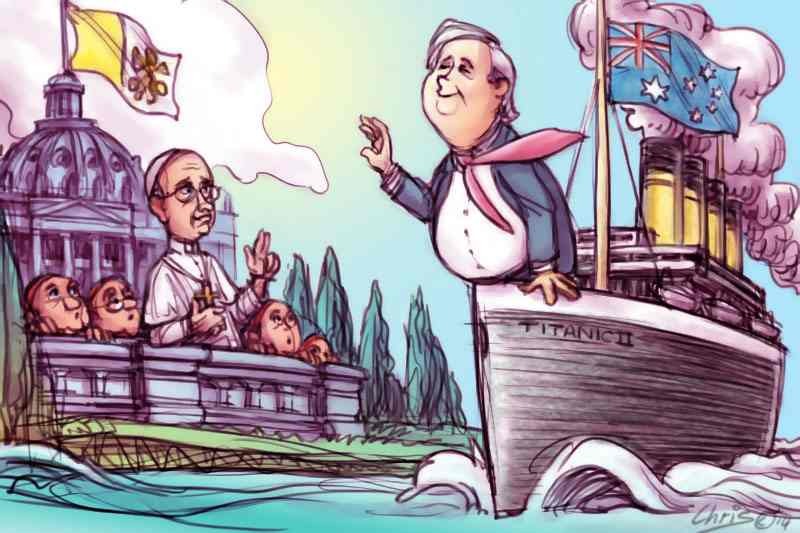 Clive Palmer is aware both the world and politics are amoral. He knows how to play the game. Playing the game he has clean bowled Abbott's whole team on one issue and will do so again. In doing so he may well end up protecting much that is good in Australian society. The Pope and Archbishop of Canterbury - the latter an experienced high level ex-businessman - have much of worth to say on economic justice. I take them more seriously than I take the likes of Ross Garnaut and their "think tanks". But, in the real world of politics, you need to be street smart. Clive Palmer is. Clive Palmer is changing the mould. He's the first serious politician from the populist Right in this country for many years for whom their policy is not driven (at least in part) by racial or sectarian bigotry. I'm not one of Palmer's political supporters. (I hang out on the social democratic centre-left and have been known to exclaim "Don Chipp, where are you now when we really need you?") Nevertheless, I'm looking forward to the impact of Clive Palmer in Parliament. I rather think he'll humanise the place. Great drawing of Clive on the Titanic II. It brought to mind these lines from "The Convergence Of The Twain" by Thomas Hardy: "On being anon twin halves of one august event,/Till the Spinner of the Years/Said 'Now!' And each one hears,/And consummation comes, and jars two hemispheres. Democracy is a messy way of governing/ruling a country. It is also one of the best ways of dissipating the power centres that exist in society so that no one power group/grouping dominates the others ad infinitum. As long as people believe they have some say in how their leaders are chosen and behave they are less likely to resort to violence to make their point(s). One of the major tasks of a democratic government is to oversee a fair and just distribution of the wealth of the country. In Australia this means encouraging individual entrepreneurs in their endeavours to the extent that they don't exploit "the drawers of water and the hewers of wood", I don't really know what motivated Clive Palmer to break away from the LNP in Queensland but on the published evidence it would seem he didn't get the help he expected from an organisation he had bankrolled for some years. To show them (Qld LNP) and their federal colleagues that he was not a man to be crossed with impunity going into federal politics was a big gamble that seems to have paid off - but can his lucky (?) run continue? An interesting article ‘’provocative thoughts- somewhat out of the square ‘’ which leads to other naïve thoughts Al Gore,first billionaire from climate scare campaigns ??? Al & Clive Palmer have they mutual vested interests ???? alternative energy facility !!!!!! Al ---- < ----climate change ---carbon emission ----computer modelling ---predictions--- identify the hypothesis to be tested. generate predications from the hypothesis. - check whether predictions are correct. If the predictions are correct, then the hypothesis is confirmed. if not, then the hypothesis is disconfirmed . --- last decades inverse to what Al predicted, has occurred Trip a farce -- Aussies retracing Sir D Mawson -- no flowers/ meadow around hut !!! --- expanding ice sheet trapped ship --- helicopter rescue IPCC reports discredited--- Clive --< our senate is a house of review and should not prevent democratic election mandates from being properly established ???? Pope Francis- < who has a strong regard for both economic policy and common humanity.-- $1 billion per month interest , crippling& ineffective carbon tax are uneconomic and a disaster to - - ----------common (Aussie ) humanity – Could Francis trust Clive !!!!!!!!!! Please, these alliances are merely PR exercises and about further self promotion, so the public rip off in accruing massive profit at the expense of the workers and community to whom it really belongs, appears more palatable. True common good is not about making alliances to make oneself look good! The wealth belongs to the people, these are just exercises to make the rip off look legitimate. I too like Clive Palmer. I am so angry with the current Liberal Catholic leaders mostly educated by elitists in the Jesuit community. As a Catholic who has had to put up with sexual abuse scandals which just get worse. We now have to put up with Liberal leaders who are anything but Christian in their attitudes to the poor and disenfranchised . There is no compassion and you as an order have produced and nurtured such leaders that have produced such destructive class driven policies. I am an ordinary Catholic woman not from a privileged elitist background why should I continue with a religion that shows such blatant hypocrisy.I am neither an intellectual nor an economist but I have values and ethics that are gospel driven that do not need a church such as this. I am also tired of words and rhetoric. Yet to be convinced by Pope Francis and the media projection and "market sell" of a new Catholicism.To end my comment there is nothing worse than a right wing catholic liberal who treats me as stupid .Rage is what I feel ,justified rage !! Here's one person who does not have any liking or admiration for Palmer at all.He is in politics for two rasons - revenge on the LNP for not giving in to his demands and to further his own financial interests. He will use anyone he can to achieve his aims. Please, don't be taken in by Palmer. He is a dangerous man, a threat to our democracy and he WILL hold this government to ransom to get what HE wants. We already have government for Palmer, not for us. Has anyone questioned the impropriety of Palmer, a mining magnate, instructing his party's senators to vote in his interests on the repeal of the carbon price and the MRRT? How is this allowed? It is a huge cionflict of interest. PUP senators should have abstained from those votes but they did not and no-one seems to have questioned their actions. Palmer may have conned Al Gore, but I'm wondering how Gorte feels now. Used and abused, I would imagine.